ELKTON, MD. 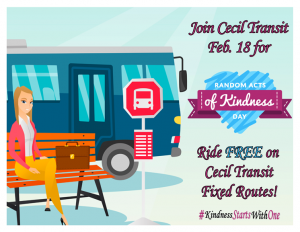 — Cecil Transit will be observing Random Acts of Kindness Day on February 18th, 2019 with a Free Ride Day. Random Acts of Kindness Day, traditionally celebrated on Feb 17th, now spans a week-long event encouraging individuals and organizations to find a way to brighten someone’s day! This act could be something as big as organizing a fundraiser for a worthy cause or something as small as helping a neighbor carry in their groceries. Studies show the acts of kindness, of any magnitude, can lead to increased feelings of self-worth and happiness. These acts also alleviate stress for both the giver and receiver. Cecil Transit will celebrate this holiday by providing free rides on all Fixed Routes, excluding deviation requests. We ask that you try to pay it forward and do something kind for someone, even yourself! You can share your random act of kindness on social media with the tags #KindnessStartsWithOne or #RandomActsOfKindness. “This is a wonderful opportunity to give Cecil Transit a try and learn about their services, but more importantly to extend kindness and encourage our community to ‘pay it forward’ as well,” said County Executive Alan McCarthy. To learn more about services provided by Cecil Transit, visit www.ceciltransit.com or call 410-996-5295, Option #2.